Are you having trouble getting your home decorated? If you are…you are not alone! Decorating your home can be overwhelming and tough. Empty walls…empty shelves…it can be extremely daunting. We did an Instagram poll this week trying to nail down the main decorating struggles we all run into, and this was the feedback we got! 1. Where to start: We are often overwhelmed by the amount of spaces we are wanting to decorate all at once, especially when moving into a new home. The best thing to do is to start with one room at a time. Start with the main living areas first where you gather often. These spaces could include but are not limited to… the family room, dining room, and kitchen. Once you have those areas nailed down, you can then move onto other spaces. 2. Money: Invest in items that have longevity. These items include clocks, candle sticks, mirrors, etc. and are items that you can hang onto for years! 3. Color Schemes: It is a good idea to have a base of neutral items, and add or incorporate touches of color. Pick a color scheme YOU love and find accessory items that fit within that realm. 3-5 colors are best without it becoming overwhelming to the eye. 4. Styling: Don’t be afraid to mix and match patterns and differing decor styles. You may be surprised on just how well they actually look together! There is no rule book you have to stick to to achieve a great look within your home. 5. Balance: Try to find a happy medium between minimalist + clutter. Don’t decorate so simply that your space doesn’t look or feel “finished”, but also don’t have so many items that it looks overwhelming to the eye. 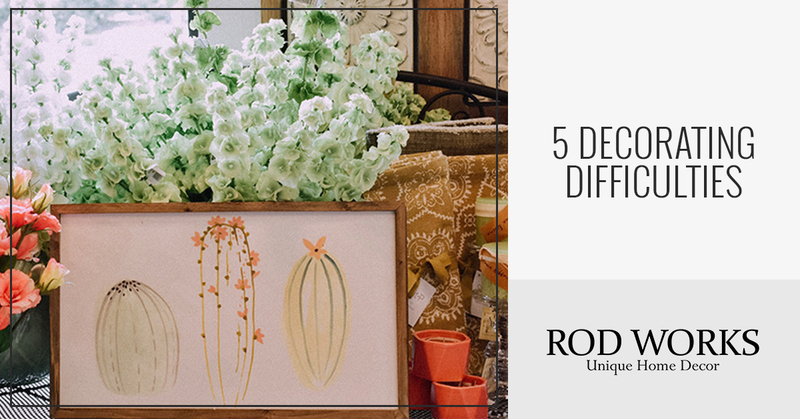 If you are running into any of these Decorating Difficulties, look no further. We can help…FOR FREE! An in-store decorating service at all Rod Works locations, where we help you one-on-one to create the decor style you are looking for. Come in with measurements, an idea in mind, and we can help you do the rest! It is our goal to have you leave our store feeling refreshed and confident in the items you purchased. We want you to be happy and excited to go home and decorate your space!